Have you got a little pirate you would like us to hand paint? 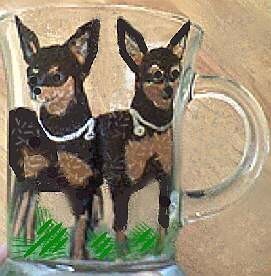 Clearly Susan hand painted Jack Russell Terrier wine glasses show the fiesty spirt and agressive nature of this small, stocky built dog bread for hunting foxes in the late 1700's. 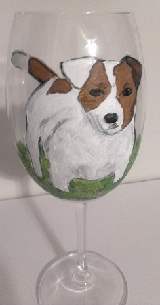 We hand paint on Jack Russell Terrier wine glasses the markings of the Jack Russell Terrier known for their white body and the distinctive brown patch over the eye. This little pirate nature of a dog loves to dig in holes looking for their prey. If you a lover of this breed then send us a picture of your tenacious, high energy Jack Russell Terrier and we will hand paint him on wine glasses, mugs, plates, platters anything that you can think of.